Many things including patient weight, activity level and implant bearing surface can affect the durability of a hip implant. The bearing surface is defined as the two parts of the artificial hip that glide together throughout motion. In total hip surgery, the bearing surfaces are called the femoral head and the acetabular insert. A variety of materials are available for each of these components including cobalt chrome metals, plastics and ceramics. Over 90% of patients receiving hip replacements achieve complete relief from pain and significant improvement in joint function. * However, artificial hips are still subject to wear and this wear may affect the long-term life of an implant. In recent years, there have been significant advances in bearing materials which are designed to extend the life of the implants. You should talk to your physician about the best implant for you. Femoral heads have been traditionally manufactured from stainless steel, cobalt chrome or alumina ceramic. Biolox® delta is an alternative to conventional implants that also yields potential benefits of strong, longer wearing ceramics. Biolox® delta is biocompatible, scratch resistant and resists wear like alumina ceramic, but also provides additional strength. In laboratory testing, Biolox® delta ceramic is up to 50% stronger than alumina ceramic.1 The strength comes from an advanced type of ceramic that’s used to manufacture Biolox® delta, which is what gives it a pinkish color. The strength of this material allows manufacturing of increased sizing of femoral heads so your surgeon has a broader implant selection to provide the implant that fits you best. Crosslinking is an advanced method of manufacturing polyethylene that helps improve the wear performance of the plastic insert used in total hip replacement. Acetabular inserts made from the X3® technology include special processing which contributes to its wear resistance. The X3® bearing technology is a new, advanced polyethylene implant which has demonstrated extremely low wear in the laboratory and may have similar wear performance clinically. 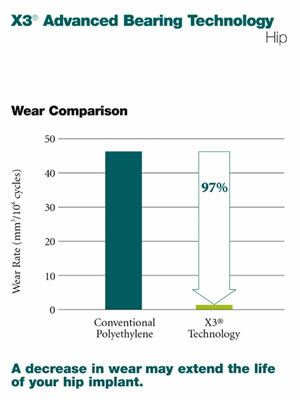 Through Stryker’s patented manufacturing process, X3® has demonstrated a 97% wear reduction over conventional polyethylene in laboratory testing.2 This decrease in wear may extend the life of your implant. The excellent wear characteristics of Biolox® delta and X3® Advanced Bearing Technology provide an extremely durable bearing surface for total hip replacement, which may be important for younger, more active patients. 1. Stryker Test Report RD-05-013. a. Wang A. et al. Tribology International, Vol. 31, No. 1-3:17-33, 1998.
b. Essner A. et al. 44th Annual Meeting, ORS, New Orleans, Mar. 16-19, 1998:774.
c. Essner A. et al. 47th Annual Meeting, ORS, San Francisco, Feb. 25-28, 2001:1007.